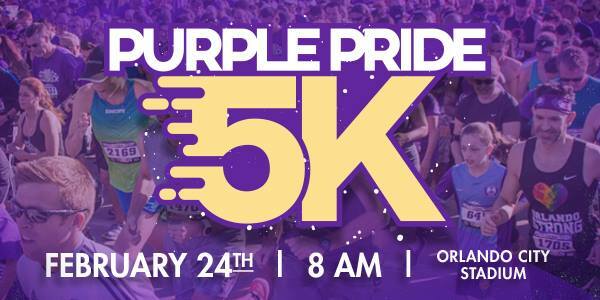 The Purple Pride 5K presented by Orlando Health, SunPass, JetBlue and Publix returns for a 4th straight year with a start and finish taking place at Orlando City Stadium. This years' 5K course will feature a lap within Orlando City Stadium’s main concourse. *Details regarding discounts available for Season Ticket Members and LionNation Premium Members have been emailed. STMs can contact their Member Services Representative or email tickets@orlandocitysc.com with any questions. Entry fee and any additional match tickets purchased are non-refundable and non-transferable. Each runner will receive one ticket to a select Orlando City match during the 2018 MLS season as part of this package. During the online registration process, you will have the ability to choose which match you would like to attend. An exclusive promo code will be sent out to the email you have provided in registration a week prior to the match you have selected. This promo code will allow you to redeem your match ticket from this registration. In addition, you will have the ability to purchase additional tickets to the match you choose at a price of $25, TicketMaster fees will apply.